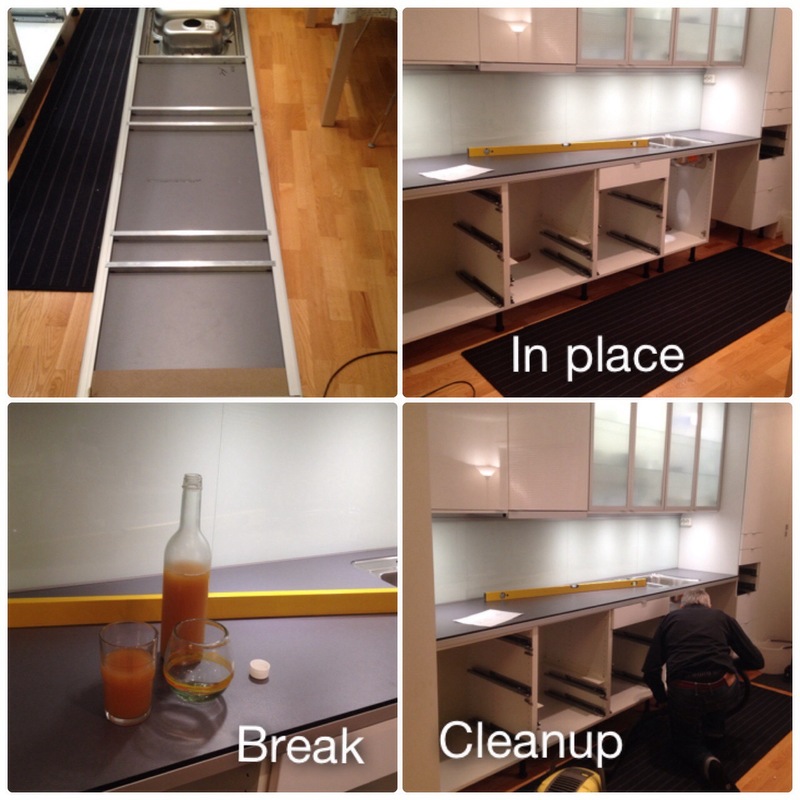 After our rather stressful day 4, our next task – putting in the new countertop – was almost (I said, almost) easy. My countertop consists of a 10 mm thick laminate + a 30 mm thick aluminium list. To support the laminate, there are some support bars across the underside of the countertop. As you can see from picture 1 below. These support bars are normally spaced so that they will rest on the under cabinet walls, to make everything really strong and supporting. On the original countertop, the support bars were placed correctly, on the new replacement countertop, they didn’t bother about taking this consideration, and it turns out the support bars were in the wrong place. As an example, one of them was right smack in the middle of where my cooker was supposed to go! We decided that rather than move the other ones to the area that they needed to be, we would just add bars instead. So that’s what we did, we used the one we removed and stole one from the old countertop 😉 And what you see on picture no 1, is a countertop ready to be installed. Not allot of ways around that one, other than spend the next half hour, cleaning away all old silicone, and then give the wall a quick repaint to make sure it’s protected. So NOW we could have a well deserved home-made apple juice break!!! At least you’re still moving in the right direction! When you said you were going to replace your counter-top, I envisioned it being smoother for you . . . with a few less snags. But you’re rounding the home stretch!